We organise ourselves and the work of sailing the boat around what is called a ‘watch’ system. There are four of us so we take turns at being in charge. When we are on passage like this, the boat never stops and needs to be sailed 24×7. Our watch system starts at 0900 till 1300, 1300 to 1700, 1700 to 2100. At 2100 we change to 3 hour watches for the hours of darkness so it goes 2100 to 0000, 0000 to 0300, 0300 to 0600 and 0600 to 0900. That means each one of us does a night watch and we each lose as little sleep as possible. Because there are only 3 four hour day watches, you don’t end up doing the same watch every day. Last night I had the 2100 to midnight watch. Normally the boat sails itself. In fact, the boat doesn’t know that it is dark. It gets trickier when things don’t stay stable. Last night nothing stayed stable. The wind was from nothing to 20 kts and the direction from east round to southwest. Add to that no moon and torrential rain. The net effect is that you can’t see a thing, are getting soaked and the boat won’t stay doing what you want it to do. Fortunately it is a very clever boat and now that I have gotten used to it, putting up and down the sails and making them larger or smaller is genuinely just the press of a button. No more Hosey knots. It all reminds me of night flying where you couldn’t see anything and just had to trust that you knew what you were doing. At least night flying the aeroplane didn’t pitch and buck about, which is he other small problem. Anyhow, I am on 0000 to 0300 tonight. Let’s hope for an easier time! Well today we had a very happy boat. The wind behaved very well last night and my watch was a lot simpler. I listened to music and tried to phone home on the satellite phone. No one picking up but granny , who is coming to live with us. The winds continued to be kind today and not only have we made very good progress, but we have also caught fish, which is a certain morale booster. On the progress front, my i- pad tells me that we are averaging about 8.2 knots . This is very good and the wind is forecast to stay about the same. We are pointed more or less where we want to go so in 24 hours we will cover 8.2 x 24 nautical miles which is about 196 nm. That is very fast and will bring us to Hiva Oa well before my previous estimate of 10 th May. We are showing 2444 nm to run which comes out as a further 12.5 days meaning we arrive on 30th April 10 days earlier than previous estimates. All in all I expect we will arrive somewhere between the two having taken around 24 days from leaving the Galapagos on 12th April. On to the fishing. Marigold is getting a bit annoying. We are not really set up properly to troll two lines, so like a good crew, I rig up Marigold and let her fish where she wants to and I then fit in , depending on the conditions, where I think that I can avoid any tangles. This is akin to wanting to score goals but having to play as the goalkeeper. Today has been the first day that there have been fish around. Marigold caught 3 and lost one mahi mahi. I am the idiot standing on the transom at the back with the gaff, swinging wildly on my lifeline trying to get the fish in and not fall in or hook myself. So far a 100% record. I caught a mahi mahi too which happened to be hanging around my goal area. As I reeled it in, it took a dive and then something else much heavier grabbed it, bust my line and took my lure. Not a happy Willie. To add further insult to injury, I am doing the washing up in the galley after a not to be beaten dinner of lightly battered mahi mahi and fried potatoes. The galley has a small porthole which was open. A suicidal 6 inch long flying fish, flew through the window and clunked me on the head. I had no idea what had hit me until I heard flapping at my feet. 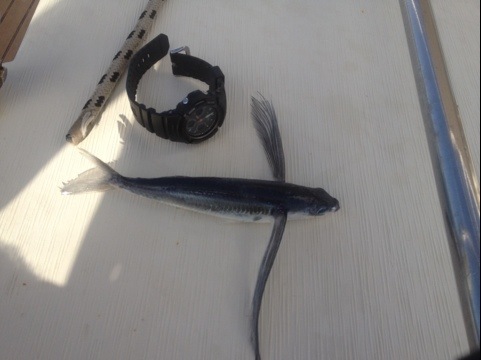 This was the luckiest flying fish as I chucked him back overboard. His wingman missed the window and died of head injuries on the deck. My watch tonight is 3 am to 6am so fishing operations will commence early ahead of Marigold who undergoes some sort of secret fish attracting ritual in the back cabin each day. Ceviche for lunch tomorrow. Mahi mahi marinated in lemon juice with garlic onion and ginger, served with chopped tomatoes and anything else green we can find. P.s. we are eating a lot of potatoes because they are going off. Headline…. Potato famine on paddy boat crossing pacific. Today is 20th April and it is a special day because it is Sarah’s birthday. For the strangers out there Sarah is my wife. I couldn’t be having this great experience without Sarah’s support and I want to take this opportunity to publicly thank her and the rest of my family. Have a really happy birthday Sarah and I am looking forward to getting back home to you.Thanks also to those of you who are supporting Sarah and keeping her involved while I am gone.